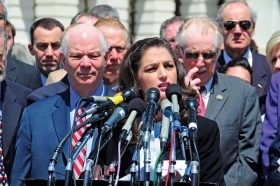 Dealer Tammy Darvish spoke at a Washington press conference this year on behalf of rejected dealers. She was flanked by supporters Sen. Benjamin Cardin D-Md. left and Rep. Roscoe Bartlett R-Md. WASHINGTON -- The rejected dealers group that was instrumental in getting an arbitration law enacted plans to be around a long time. The Committee to Restore Dealer Rights was formed in June to help win reinstatement for 789 terminated Chrysler Group dealerships and 1,350 rejected General Motors stores. Headed by Ohio dealer Alan Spitzer and Maryland dealers Jack Fitzgerald and Tammy Darvish, the group plans to help rejected dealerships through the six-and-a-half-month arbitration process that is beginning. But it also wants to continue after that with operations separate from those of the National Automobile Dealers Association. GMAC Financial Services was on the brink of bankruptcy a year ago and converted to a bank holding company. The federal government invested more than $12 billion in GMAC and made it the primary lender for the new Chrysler and its dealers when Chrysler filed for bankruptcy. Chrysler Financial, which got $1.5 billion in federal loans, has been downsizing and is due to wind down its business by the end of 2011.